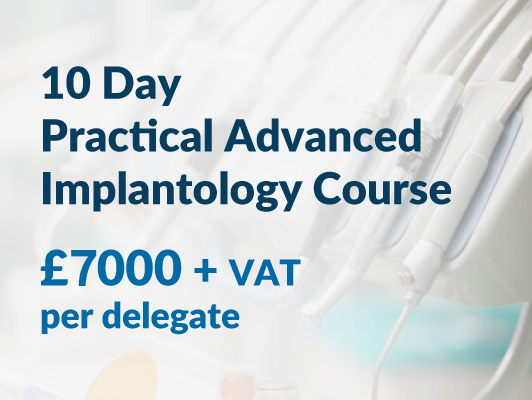 If you have a verifiable record of being taught the theoretical aspects of implant dentistry but are looking for dedicated hands-on tuition in a clinical environment, this course is for you. • Our unique training allows you to treat patients covering diagnosis, placement and restoration. You will complete a several full cases. • We will teach you to assess patients’ needs and suitability, and perform comprehensive assessments. • Take you through the placement of dental implants. • Gain clinical skills, core competencies, and confidence within a supervised clinical environment. • Develop key advanced skills about the restoration of implants and gain a better understanding of cases requiring more complex rehabilitation. You will also receive a comprehensive Personal Skills Portfolio packed full of detailed case notes and photographs to evidence your work. We aim for you to treat a variety of cases covering diagnosis, placement and restoration – as well as augment bone. You will also plan and treat a variety of cases using guided surgery. This practical course aims to provide delegates with the skills required to place dental implants, gaining clinical skills, core competencies and confidence. By the end of the course participants should also be able to select suitable cases where guided surgery would be of benefit and be able to plan and carry out guided surgery on simple cases. Taught by hands-on tuition in a clinical environment under the supervision of a team of highly trained professional tutors, Dentale’s courses are run in accordance with the GDC guidelines.